This particular Hindu Paranormal Healing Tantra makes the use of a basic Surya or Sun Mantra along with the Suryamukhi Flower called in English as the Sunflower to give relief to any person who has suffered from a Stroke. Stroke in the context of this Surya Mantra Experiment includes a Sunstroke, Fit , Seizure or Epileptic Attack or for that matter any other type of Stroke or malfunction of the Brain or Body, which triggers off the Stroke. The Surya Mantra Remedy as I have mentioned is extremely simple an easy to perform all that is needed is a Sunflower. 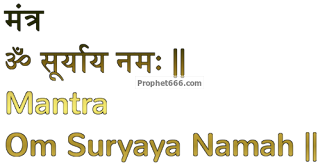 The practitioner has to get up early in the morning at the time of Sunrise and sit down or stand comfortably under the Soothing and Healing of the Rising Sun and lightly rub the Sun Flower on his or her forehead and chant the simple Surya Mantra, which, I have shown in the image included in this post. The Mantra Chanting along with the rubbing of the Sunflower on the forehead should be done for about 5 minutes and then the practitioner should throw the Sunflower in the South Direction. If the practitioner experiences any discomfort while chanting the Mantra, he should immediately discontinue the Mantra Chanting. After completing the simple Surya Mantra Experiment to get relief from Strokes, the practitioner should stand comfortable under the Healing Ray of the Rising Sun for another 5 Minutes or so. Again, if discomfort is experienced, the practitioner should discontinue the Mantra Experiment. Notes- This Surya Mantra Experiment can be performed daily until noticeable relief in experienced by the practitioner. The Mantra Sadhana does not involve any other kind of supporting worship, or Tantra other than what I have mentioned in this post. It is not mandatory to have a bath or brush the teeth before starting the Mantra Remedy, to do so or not depends entirely upon the wishes of the practitioner. sir my dad just got a stroke and appreciate if u can help for a remedy . This Surya Mantra remedy is specific for getting relief from strokes.